When the National Aeronautics and Space Administration was established in October 1958, its managers and engineers were still three years away from putting man into space. Despite the early enthusiasm for lunar colonies and large orbiting space stations, Americans did not explore the moon until 1969. Furthermore, Congress did not approve the funds NASA required for an orbiting laboratory larger than the three-man Skylab, which was launched in 1973. The evolution of spaceflight hardware was necessarily slow and incremental, each spacecraft and mission building on the experiences of its predecessors. Project Mercury (1961-1963) proved that one man could orbit the earth and return safely in a blunt-shaped vehicle. John J. Glenn, Jr., became the first American to be placed in orbit on February 20, 1962. The next step in NASA's manned space program was Project Gemini (1965-1966). Large enough to accommodate a crew of two, Gemini spacecraft were used to perfect the rendezvous and docking maneuvers that would be required for a mission to the moon. A manned lunar landing by the end of the decade was the ambitious goal given the young agency in 1961 by President John F. Kennedy. It was a feat designed to exhibit the technical prowess of the United States at a time when the USSR was capturing all the "space firsts." The Apollo program (1968-1972) was NASA's largest, most expensive venture -and a highly successful one. An Apollo crew first circled the moon in 1968; the first landing would follow the next year. NASA's second decade began with the successful landing of the first Apollo crew on the moon. The Eagle touched down on the surface on July 20, 1969, wit h Neil A. Armstrong and Edwin E. Aldrin, Jr., on board. Apollo 11 crewman Michael Collins remained in the orbiting command and service module (CSM) while his two mates completed their cursory exploration of the Sea of Tranquility. After 21.5 hours, Armstrong and Aldrin rejoined Collins for the three-day voyage back to  earth. Apollo 9 (March 1969) and Apollo 10 (May 1969) had helped pave the way for this historic mission, and six more crews would prepare for flights to the moon. The crew of the second landing mission, Apollo 12 (November 1969), spent 31.5 hours on the surface in the vicinity of the Ocean of Storms near the Surveyor 3 spacecraft. The men devoted more than seven hours to excursions on foot, collecting rock and soil samples, setting up scientific experiments, and photographing this new domain. Apollo 13 (April 1970) never made it to the moon. An onboard power failure led to mission's failure. On each of the next four flights, Apollo 14 (January 1971), Apollo 15 (July 1971), Apollo 16 (April 1972), and Apollo 17 (December 1972), the astronauts spent more time on the surface, collected additional samples, explored new regions of the moon, and extended their mobility by means of lunar roving vehicles. Enthusiasm and excitement in Washington over lunar exploration gave way to increased concern over the agency's budget. Even the general public, if not quite bored with it all, was taking "moon shots" in stride. The program ended prematurely in the eyes of some NASA managers and scientists in 1972. Taking advantage of hardware developed during the Apollo program, the agency's advanced planners in the mid-1960s suggested that an orbiting laboratory could be assembled using components of the Saturn launch vehicle and visited by crews in Apollo spacecraft. The result was Skylab, an orbital workshop constructed from a Saturn IVB stage. It was launched in May 1973 and visited by three crews over the next nine months. The Skylab missions not only contributed to life scientists' understanding of man's ability to adapt to the space environment, but also gave scientists in other disciplines the opportunity to send experiments aloft for extended periods of time. Another flight project that profited from Apollo hardware development was the Apollo-Soyuz Test Project (ASTP), the joint U.S.-USSR mission flown in July 1975. After many months of preparation and training, a three-man Apollo crew met two Soviet cosmonauts in orbit above the earth. Apollo and Soyuz spent 44 hours joined in space. Although this project was a technical success, political realities did not allow the engineers, technicians, crews, and managers of the two countries to continue working together. NASA's post-Apollo plans called for a radical change for manned spaceflight -from small, expendable, cone-shaped spacecraft launched on top of expendable rockets to larger, sleeker, reusable vehicles designed to be launched by their own main engines and reusable solid rocket boosters. The new space Shuttle, part of what NASA labeled the Space Transportation System, would perform a variety of tasks in earth orbit, including delivering, retrieving, and repairing satellites, taking scientific laboratories and experiments to a specific orbit, and ferrying crews and supplies to space stations. 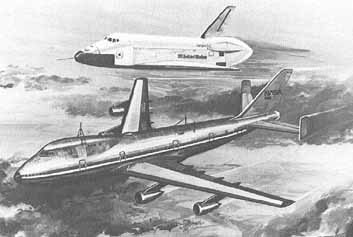 Approval to proceed with the development of a shuttle came from the White House in August 1972. Four years later, Rockwell International personnel rolled the first orbiter, Enterprise, out the factory doors. Perched atop a modified Boeing 747, Enterprise took to the air for the first time in February 1977. These approach and landing tests were completed in July. Rockwell would manufacture the next orbiter as an actual flight vehicle, which would be used in the orbital flight test program scheduled to begin in 1981. For supporters of manned flight in space, the decade may have been a disappointing one. The promise and excitement of the early Apollo years was replaced by the sober realization that there would be no big-budget high-priority manned program for the remainder of the 1970s. Shuttle had been approved, but its development  would be slow and methodical. Plans for manned expeditions to Mars and beyond were cast aside in favor of the unmanned exploration of the solar system. Money, not the state of the art or the need to exhibit technical superiority, paced NASA's activities during the second 10 years. The Office of Manned Spaceflight (OMSF) was first organized in 1961. Along with the Office of Space Science and Applications, the Office of Tracking and Data Acquisition, and the Office of Advanced Research and Technology, OMSF was under the direct control of the NASA administrator. George E. Mueller, associate administrator for manned spaceflight from September 1963 through 1969, and his three deputies built the complex management structure NASA Headquarters required to conduct the Apollo program. In addition to Apollo, OMSF established directorates for advanced missions, Skylab (formerly Apollo applications), a Space Station Task Force (added in May 1969), and a Space Shuttle Task Force (see table 2-1, Phase 1). Mueller's team carried the manned program through the first year of the agency's second decade. Myers returned to the Rockwell International Corporation in March 1974, and John F. Yardley took OMSF's reins two months later. Yardley would see the program through the remainder of the second decade. Reemphasizing Shuttle's planned role for manned and unmanned spaceflight, NASA renamed Yardley's operation the Office of Space Transportation Systems in 1977. John Disher continued to oversee advanced programs under Yardley, just as Doug Lord and Myron Malkin stayed on as directors of the Spacelab and Shuttle programs. The Skylab and Apollo-Soyuz Test Project offices were closed after the successful completion of those projects. Chet Lee became the director for Space Transportation Systems operations, an office added in 1975. The major addition to Yardley's organization was the Expendable Launch Vehicle Program, transferred to the Office of Space Transportation Systems in September 1975. Under the direction of Joseph B. Mahon, the traditional launch vehicle program had been managed by the Office of Space Science and Applications since 1961. The following table (table 2-1) traces the organization of manned spaceflight management at NASA Headquarters during the years 1969-1978. Only the major offices are included and only major changes noted. The three phases represented in the table are composites for each time period. Refer to appendix A and other NASA historical publications for complete organization charts. The reader may also wish to consult volume 2 of the Data Book series, table 2-2, for information on OMSF's organization during NASA's first 10 years. In addition to overseeing the paperwork in Washington, Mueller, Myers, and Yardley also had management authority over related activities at the Johnson Space Center (formerly the Manned Spacecraft Center), the Marshall Spaceflight Center, and the Kennedy Space Center. The Johnson Space Center in Houston was responsible for the Apollo lunar exploration program and the study of the program's returns, astronaut training, mission control, development of the Shuttle orbiter, and other activities related to man's use of space. At the Marshall Spaceflight Center in Huntsville, Alabama, the production of the Saturn family of launch vehicles was directed, and the propulsion components that would support Shuttle were being developed and tested. Launches took place from the Kennedy Space Center in Florida. [57-60] Table 2-1. Three Phases of Manned Spaceflight Management, NASA Headquarters. For a general introduction to the NASA budget process and to the budget tables in this volume, consult chapter 1. Other data that may assist the researcher interested in the cost of NASA's manned spaceflight program include budget tables in chapter 1 for Saturn IB, Saturn V, and the Space Transportation System solid rocket boosters. Chapter 6 provides budget data on the manned flight tracking network. For a more detailed breakdown on the flight project budgets, see the NASA annual budget estimates referred to in chapter 1. Review the bottom notes of all tables carefully before making conclusions about totals for any particular project or year. As did NASA's overall budget, the manned spaceflight budget declined almost yearly from FY 1969 through FY 1974, when it dropped below $1 billion for the first time since FY 1962 (see table 2-2). Apollo, NASA's largest budget item for many years, saw funding for the last time in FY 1973. Totals for any one program are hard to define, but NASA issued the following figures for its major manned ventures: Mercury, $392.6 million; Gemini, $1.283 billion; and Apollo, $25 billion ($21.35 billion through the first lunar landing in July 1969). The grand total for the "expendable-generation" manned spaceflight program came to $29.5 billion, with $2.6 billion for Skylab and $250 million for the Apollo Soyuz Test Project. 3 These totals include expenditures for facilities, salaries, research and development, operations, and hardware (spacecraft and launch vehicles). The following tables are concerned with only research and development monies: spacecraft, launch vehicle costs, operations, and supporting development. In addition to Apollo, Skylab, and the Apollo-Soyuz Test Project, the space Shuttle program was a major item in the manned spaceflight budget. Funds for Shuttle studies were first programmed in FY 1970. After presidential approval of the reusable Space Transportation System was granted in 1972, the budget requests for Shuttle increased steadily, almost doubling the previous year's request each year, FY 1973 through 1976. Funds for hardware production for the orbiter and the main engine were first programmed in FY 1977-1978. When the Office of Manned Spaceflight was renamed the Office of Spaceflight in the fall of 1975, the newly organized office assumed management of "expendable launch vehicles," a budget category associated with the Office of Space Science and Applications since 1961. Table 2-35 summarizes the expendable launch vehicle funding history from the FY 1977 request only; for data on FY 1969-1976 consult chapter 1. Table 2-2. Total Manned Spaceflight Funding History (in thousands of dollars). Table 2-3. Programmed Costs of Manned Spaceflight Programs (in thousands of dollars). Table 2-4. Spaceflight Operations Funding History (in thousands of dollars). Table 2-5. Spaceflight Operations -Skylab Funding History (in thousands of dollars). Table 2-6. Spaceflight Operations -Skylab -Experiments Funding History (in thousands of dollars). Table 2-7. Spaceflight Operations -Skylab -Mission and Program Support Funding History (in thousands of dollars). Table 2-8. Spaceflight Operations -Skylab -Space Vehicles Funding History (in thousands of dollars). Table 2-9. Spaceflight Operations -Skylab -Workshop Cluster Funding History (in thousands of dollars). Table 2-10. Spaceflight Operations -Skylab -Payload Integration Funding History (in thousands of dollars). Table 2-11. Spaceflight Operations -Skylab -Operations Funding History (in thousands of dollars). Table 2-12. Spaceflight Operations -Apollo Soyuz Test Project Funding History (in thousands of dollars). Table 2-13. Spaceflight Operations -Apollo Soyuz Test Project Command and Service Module Funding History (in thousands of dollars). Table 2-14. Spaceflight Operations -Apollo Soyuz Test Project-Docking Module and Docking System Funding History (in thousands of dollars). Table 2-15. Spaceflight Operations -Apollo Soyuz Test Project Operations and Flight Support Funding History (in thousands of dollars). Table 2-16. Spaceflight Operations -Apollo Soyuz Test Project -Experiments Funding History (in thousands of dollars). Table 2-17. Spaceflight Operations -Apollo Soyuz Test Project - Launch Vehicle Funding History (in thousands of dollars). Table 2-18. Spaceflight Operations -Development, Test, and Mission Operations Funding History (in thousands of dollars). Table 2-19. Spaceflight Operations -Mission Systems and Integration Funding History (in thousands of dollars). Table 2-20. Spaceflight Operations- Space Life Sciences Funding History (in thousands of dollars). Table 2-21. Spaceflight Operations -Planning and Program Integration Funding History (in thousands of dollars). Table 2-22. Spaceflight Operations -Space Transportation System Operations Funding History (in thousands of dollars). Table 2-23. Space Shuttle Funding History (in thousands of dollars). Table 2-24. Space Shuttle-Orbiter Design and Development Funding History (in thousands of dollars). Table 2-25. Space Shuttle-Main Engine Design and Development Funding History (in thousands of dollars). Table 2-26. Space Shuttle -Solid Rocket Booster Design and Development Funding History (in thousands of dollars). Table 2-27. Space Shuttle- External Tank Design and Development Funding History (in thousands of dollars). Table 2-28. Space Shuttle-Launch and Landing Funding History (in thousands of dollars). Table 2-29. Space Shuttle-Other Categories Funding History (in thousands of dollars). Table 2-30. Apollo Funding History (in thousands of dollars). Table 2-31. Apollo -Spacecraft Funding History (in thousands of dollars). Table 2-32. Apollo-Saturn Launch Vehicles Funding History (in thousands of dollars). Table 2-33. Apollo-Mission Support/Operations Funding History (in thousands of dollars). Table 2-34. Advanced Missions/Programs Funding History (in thousands of dollars). Table 2-35. Expendable Launch Vehicles Funding History (in thousands of dollars). This section of the chapter is divided into four parts, each addressing a major manned spaceflight program for which there were missions flown or major hardware developed: Apollo, Skylab, the Apollo-Soyuz Test Project, and the Space Transportation System. The close of NASA's first decade is associated by many with photographs taken by Apollo 8 (December 1968) astronauts of the blue earth rising over the moon's horizon. For the first time, man saw earth from the vicinity of its natural satellite. Seven months later, two members of an Apollo crew began to explore the lunar surface on foot. The Apollo lunar expeditions built upon the hardware and mission experiences of Mercury, Gemini, and Apollo earth-orbital flights. From one astronaut to two, to three; from suborbital, to orbital, to cislunar, NASA engineers, scientists, and crews gained confidence in and expertise with hardware and mission operations (see table 2-36 for a chronology of development and operations, 1969-1973). Apollo 9 (March 1969), launched by Saturn V, which would send crews to the moon, demonstrated in earth orbit the feasibility of lunar orbit rendezvous and command and service module-lunar module (CSM-LM) docking in a 10-day mission (see table 2-37). Apollo 10 (May 1969) was the last rehearsal before the actual lunar landing, during which the lunar module's performance was evaluated in lunar and lunar environments. It was found satisfactory during the 8-day flight (see table 2-38). All systems were ready for the first manned lunar landing. Apollo 11, with Commander Neil A. Armstrong, Command Module Pilot Michael Collins, and Lunar Module Pilot Edwin E. Aldrin aboard, was launched from the Kennedy Space Center's Launch Complex 39A the morning of July 16, 1969. After 1.5 orbits, the spacecraft was sent into a lunar trajectory by the launch vehicle's S-IVB stage, with CSM-LM docking taking place shortly thereafter. After a three-day cruise, the crew reached the vicinity of the moon on the 19th and went into lunar orbit (see figs. 2-3 and 2-4). The commander and the lunar module pilot made their way safely to the moon's surface on board Eagle, the name they had given their lunar module, on the afternoon of the 20th. Neil Armstrong took the first step on the lunar surface at 9:56 p.m., July 20. The mission's primary objective, of course, was the landing, but the crew also came prepared to conduct a series of scientific experiments, including the gathering of soil and rock samples (see table 2-46 for a complete list of lunar mission experiments) and to photograph the extraterrestrial scenery. This first crew of lunar explorers spent only 21.5 hours on the moon, all the time the mission planners had scheduled for this first cursory look at earth's satellite. The ascent stage of the lunar module lifted off the surface on the 21st and mated with the orbiting command and service module. After jettisoning the LM, Apollo 11 began its journey back home, splashing down in the Pacific Ocean on July 24 (see table 2-39). The Apollo 11 astronauts left behind them a plaque on the leg of the LM's descent module that read: "Here Man from the planet Earth first set foot upon the Moon, July 1969 A.D. We came in peace for all mankind." The crew brought back to earth 21 kilograms of lunar surface material for analysis, still and television images of this new world, data on the moon's composition and activity, and a decided sense of accomplishment. Source: JSC, "Apollo Program Summary Report," JSC-09423, Apr. 1975, p. 4-14. Figure 2-2. Apollo Lunar Module. The designers of the Apollo lunar module (LM) could ignore the requirements for aerodynamic streamlining demanded by vehicles that flew in or returned through earth's atmosphere. This ungainly looking vehicle operated only in space. The two-stage spacecraft, carried to the vicinity of the moon docked to the Apollo command module, was designed to land two Apollo astronauts on the moon's surface. From lunar orbit, where it was released by the Apollo command and service module (CSM), the LM's descent and ascent stages functioned as one spacecraft. During their time on the surface, the crew lived in the LM's ascent stage. When it was time to return to the waiting CSM, the descent stage provided a launch platform for the ascent half of the lunar module. It took more than two years to design the LM, with its makers, led by Grumman Aircraft Engineering Corporation, fighting weight gain long after a configuration was approved The most troublesome, critical, and heavy of the LM's components were its 18 engines-descent propulsion (43 900 newtons),- ascent propulsion (15 500 newtons), and 16 small attitude control engines clustered in quads around the ascent stage. Propellant for these engines accounted for more than 70 percent of the spacecraft's total' weight of 1500 kilograms. The ascent stage was basically cylindrical 0.29-meter diameter, 3.75-meter height), but with angular faces. its aluminum skin was encased by a Mylar thermal-micrometeorite shield, The cruciform structure of the descent stage supported the descent engine and its 4 fuel tanks. Four legs (maximum diameter 9.45 meters), the struts of which were filled with crushable aluminum honeycomb ,for absorbing the shock of landing, were capped by footpads. The descent stage (3.23 meters high) was also constructed of aluminum alloy. A ladder attached to one of the legs gave the crew access to the surface. A docking tunnel (0. 81-meter diameter) was provided for crew transfer between the command module and the LM ascent stage. After the surface operations were completed and the crew returned via the ascent stage to the CSM, the LM was jettisoned. A LM was included on a manned Apollo mission for the first time in March 1969 (Apollo 9). For more information on spacecraft systems, see volume 2, table 2-55. Source: JSC, "Apollo Program Summary Report," JSC-09423, Apr. 1975, p. 4-58. Figure 2-3. Typical Apollo Lunar Landing Flight Profile. Figure 2-4. After the S-IVB stage had placed the Apollo spacecraft on its proper trajectory to the moon, the Apollo command and service module-lunar module adapter panels blossomed outward. The CSM separated from the launch vehicle stage, pulled away, turned around, docked with the lunar module, and then pulled the LM away from the S-IVB. In this- docked configuration, the spacecraft made its way to the moon. Source: Rockwell International, "The Apollo Program," 1968, p. 121. The next Apollo mission, in April 1970, was the only one that failed to reach its objective. After only 56 hours, Apollo 13's mission was aborted when the crew was forced to leave the CSM and depend on the LM for emergency life support. A short was indicated in the current from one of the fuel cells on the service module, which was supplying power to cryogenic oxygen tank fans. Within seconds, there were two other electrical shorts on the spacecraft. The shorts ignited the wire insulation, which caused temperature and pressure increases within the oxygen tank; a tank line in the vacuum jacket burst and caused the blow-out plug on the vacuum jacket to burst. The pressure in the service module bay rose rapidly. The crew reported their problem to mission control in Houston and began to power down the CSM. Using the LM descent engine, the Apollo astronauts placed their spacecraft on a free return trajectory to earth and spent the remainder of the return journey in the modified LM. When the service module was jettisoned a few hours before splashdown, the crew observed that the outer skin on the affected bay was badly damaged and that a large portion was missing. An hour before reentry into the earth's atmosphere, the lunar module life boat was abandoned, and the crew settled into the command module for the final stage of the flight. While Apollo 13 failed to land on the moon or accomplish any of its scientific tasks, the mission proved that the crew and support teams at mission control could work together to solve unanticipated problems (see table 2-41). Figure 2-5. Apollo 15 Lunar Surface Experiments Package. Source: JSC, "Apollo Program Summary Report," JSC-09423, Apr, 1975, p. 3-39. .....could be jettisoned was added to the service module. Housed in the SIM bay were several cameras, spectrometers, and a particles and field subsatellite, which was launched into lunar orbit before the spacecraft left the vicinity of the moon (see table 2-43). Apollo 16's commander and LM pilot reached the moon in April 1972. As had two crews before them, they drilled into the lunar core to retrieve samples and conducted a variety of tasks associated with scientific investigations. With the assistance of their LRV, the astronauts gathered 95 kilograms of samples in a 27-kilometer tour. A subsatellite carried in the Apollo SIM bay was not inserted into the correct orbit and impacted on the surface the next month (see table 2-44). The crew of Apollo 17, the last of the Apollo explorers, reached the moon in December 1972 with scientist-astronaut Harrison H. Schmitt and commander Eugene A. Cernan taking to the surface. On this last mission, the crew stayed longer, gathered more samples, performed more experiments, and traversed the greatest distance on the surface than any of the other Apollo crews (see table 2-45). These seven lunar missions, of which six were successful, represented the final phase of the Apollo program. There were a total of 33 Apollo missions, II of which were manned. The unmanned flights qualified the launch vehicle and the two spacecraft - the CMS and the LM - for manned flight. Four of the manned flights conducted before Apollo 11 man-rated the vehicle for lunar exploration. During Apollo there were no major launch vehicle failures of the Saturn IB or Saturn V and only one spacecraft failure that prevented the completion of a proposed mission.4 The tables that follow describe in detail the seven Apollo lunar missions. The selection criteria by which NASA chose its astronauts changed constantly. For the newest group of astronauts picked in 1978, the criteria differed for two categories: mission specialists and pilots. Mission specialists were required only to have a bachelor's degree in engineering, physical or biological science, or  mathematics and to meet physical standards that were more relaxed than those required of pilot-astronauts. Pilots were required to have a bachelor's degree in engineering, physical science, or mathematics and 1000 hours of first-pilot time and they had to pass a Class I physical. In this first group of Shuttle astronaut candidates were the first female and minority personnel to be admitted to the corps. Ten of the candidates were never in the military, and 25 of them held graduate degrees. [81-82] Table 2-36. Chronology of Apollo Development and Operations, 1969-1973. Table 2-37. Apollo 9 Characteristics. Table 2-38. Apollo 10 Characteristics. Table 2-39. Apollo 11 Characteristics. Table 2-40. Apollo 12 Characteristics. Table 2-41. Apollo 13 Characteristics. Table 2-42. Apollo 14 Characteristics. [89-90] Table 2-43. Apollo 15 Characteristics. [90-91] Table 2-44. Apollo 16 Characteristics. [91-92] Table 2-45. Apollo 17 Characteristics. Table 2-46. Apollo Lunar Mission Experiments. An orbital space station, from which man could launch spacecraft to the moon and the planets or at which scientists could perform a variety of investigations and observations for long periods of time, has been a goal of would-be spacefarers since long before NASA was established in 1958. NASA's first serious study of a permanent manned orbiting laboratory took place in the spring of 1959. 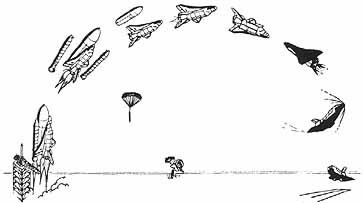 NASA's advanced planners identified five basic methods for establishing a station in earth orbit: erect an inflatable structure, which could be launched in a folded configuration and deployed once in orbit; launch matching modules into orbit and assemble them there, using a space ferry for manpower and supplies; convert a  launch vehicle stage to a habitable environment once its fuel supply had been expended (the "wet" workshop); or outfit a launch vehicle stage as a station and launch it into orbit by another vehicle (the "dry" workshop). The ideal station, of course, would be permanent and large enough for many crewmen; the adoption of a launch vehicle as a laboratory would serve as a worthy precursor to a larger, more elaborate station. As early as 1963, personnel at the Manned Spacecraft Center (MSC) were suggesting that Apollo program hardware could be used to build a space station for 18 men. NASA Headquarters established a Saturn/Apollo Applications Office in August 1965 within the Office of Manned Spaceflight to investigate the many plans that had been offered by its research centers and industry to modify Apollo era hardware to form orbiting laboratories and to evaluate possible follow-on Apollo missions. At NASA's Marshall Spaceflight Center in 1965, designers began investigating the conversion of a spent Saturn IVB stage into an orbital workshop by an Apollo crew-the wet workshop concept. Headquarters supported the idea and directed personnel at MSC and the Kennedy Space Center to cooperate with Marshall. By the next year, the Apollo Applications Office was planning three S-IVB wet workshops, three Saturn V dry orbital laboratories, and four Apollo Telescope Mounts for use on the workshops (in late 1967 the estimate was down to two workshops, one Saturn V lab, and three ATMs; in 1968 the goal was one workshop and one backup, one Saturn V lab, and one ATM). The Saturn IVB workshop would be placed in orbit and converted to a suitable environment by visiting Apollo crews. The astronauts would enter the laboratory through a special airlock module, a contract for which was let to McDonnell Douglas in August 1966. Power would be provided by large solar panels that would unfold from the workshop. Figure 2-6. Components of Skylab. The launch of Skylab 1, the orbital workshop, took place on May 14, 1973, with one major anomaly. The meteoroid shield failed to deploy properly, jamming one of the two solar panels and tearing off the second. Skylab reached the desired near-circular orbit, but without the necessary panels the internal temperature was too high for the crews that were to follow. The launch of Skylab 2, scheduled for the next day, was postponed while engineers designed a "parasol" of aluminized Mylar-nylon laminate to protect the workshop from the sun. The first Skylab crew, parasol stowed onboard, arrived at the basking workshop six hours after launch on May 25 and docked. The parasol was deployed in less than three hours, and the temperature started decreasing immediately. Another major task was to free the undeployed solar array, which the crew did on June 7 (see tables 249 through 2-51 for details on the three crew visits to Skylab). Most of the experiment data that were returned during the missions were medical, allowing the flight physicians to continually monitor the health of the crewmen. The other scientific investigators had to wait for much of the results from the flown experiments, but for most the wait was worth it. Astronomers alone received 103 000 photographs and spectra for their evaluation; earth resources specialists were treated to thousands of images, many of which were multi-spectral. The Apollo Telescope Mount proved to be revolutionary for the field of solar physics. It was clear that "it was feasible to live for extended periods in orbit without becoming disoriented or encountering major problems with the lack of a gravity field. It was simply another work environment." 8 A future space station crew would not suffer from long stays and could obviously be kept busy with scientific, engineering, and materials processing tasks. Skylab had proven that. [97-103] Table 2-47. Chronology of Skylab Development and Operations. [103-104] Table 2-48. Skylab I Characteristics. Table 2-49. Skylab 2 Characteristics. Table 2-50. Skylab 3 Characteristics. Table 2-51. Skylab 4 Characteristics. [106-108] Table 2-52. Skylab Experiments. Competition between the U.S. and the USSR served as a catalyst for NASA's early spaceflight program. Explorer followed Sputnik; Mercury followed Vostok; Glenn followed Gagarin, So it went through the first decade of the space age. But in 1968, three Apollo astronauts orbited the moon, and they were neither preceded nor followed by Soviet cosmonauts. Observers still argue over the existence of a genuine race to the moon, but Apollo landing in 1969 captured the lunar "prize" for the U.S.
On their way to meet the Apollo 11 astronauts after their return from the moon, NASA Administrator Thomas 0. Paine urged President Nixon to consider the desirability of a new era of technical cooperation with the Soviet Union, marked by a joint U.S. USSR space venture. Paine believed that the "time had come for NASA to stop waving the Russian flag and to begin to justify our programs on a more fundamental basis than competition with the Soviets". 9 Cooperation with the Soviets was an intriguing alternative, according to the NASA administrator. Nixon encouraged Paine to pursue the idea. Five years of technical cooperation among engineers working in six formal  working groups (see table 2-53) in Houston and Moscow led to the development of a unique piece of hardware-an international docking module-and agreement on mission operations, flight control, means for life support, communications and tracking, safety, and crew procedures. 11 Astronauts and cosmonauts trained together in preparation for two days of joint activities on their docked spacecraft, each group becoming familiar with the other's spacecraft, flight procedures, and language. The docking module, which would be carried aloft with the Apollo command and service module, would serve as the transfer tunnel for the two crews (see figs. 2-7 and 2-8). Soyuz 19, with Alexei A. Leonov and Valerie N. Kubasov aboard, left its launch pad at Baykonur on schedule on July 15, 1975. Hours later Thomas P. Stafford, Vance D. Brand, and Donald K. Slayton in Apollo CSM were launched to meet them by a Saturn IB from the Eastern Test Range in Florida. Two days later, the two crews began their joint exercises, with the first of two dockings taking place on the morning (EDT) of July 17. At 2:17 p.m., Commanders Stafford and Leonov met face to face in the docking module joining their ships. After a little less than two days of joint activities, Apollo and Soyuz separated, with Soyuz landing on July 21 and Apollo on July 24 (see table 2-54). Unofficially, the participants of the Apollo-Soyuz Test Project had hoped they were taking a first step in designing a truly international docking adapter and that other joint activities would follow the joint mission. Increasingly cool relations between the two countries, however, prevented further close cooperation among the technicians, engineers, and crews that had learned to work together. Despite criticism that labeled ASTP a political sideshow and a technology give-away, the project demonstrated that the two superpowers could work together and that two unlike technological products-Apollo and Soyuz - could be made compatible. Table 2-53. ASTP Joint Working Groups. Figure 2-7. ASTP Crew Transfer (Apollo on the left, Soyuz on the right). Source: JSC, "Apollo Soyuz Mission Evaluation Report," JSC-10607, Dec. 1975, p. A-16. Figure 2-8. ASTP Docking Module, a unique piece of hardware designed by a joint team of American and Soviet engineers. [111-112] Table 2-54. Apollo-Soyuz Test Project (Apollo) Characteristics. Table 2-55. Apollo Soyuz Test Project Experiments. When President Richard M. Nixon's Space Task Group asked the space agency to enumerate its goals for the future, NASA officials placed a reusable spacecraft high on its list. Engineers at NASA's field centers and at private companies had long been studying the feasibility of a vehicle that could be boosted into orbit by a reusable launch vehicle and return to earth like an airplane, ready to be used again with only limited refurbishing. NASA hoped to develop a system for orbital operations "with emphasis upon the critical factors of: (1) commonality, (2) reusability, and (3) economy". Space station modules and an earth-to-orbit shuttle that could ferry crews and supplies to orbiting stations were the two major components of this system. According to the Space Task Group report to Nixon, a Space Transportation  System would "carry passengers, supplies, rocket fuel, other spacecraft, equipment, or additional rocket stages to and from orbit on a routine aircraft-like basis". 12 Limited budgets, however, would not allow NASA to proceed with the entire Space Transportation System. President Nixon approved the development of the space Shuttle half of the plan on January 5, 1972, largely because the new program promised to be "economically sustainable". Shuttle vehicles would be designed to fly at least 100 missions, a decided advantage over the expendable Apollo generation. The development of a large space station was not approved. Shuttle crews would have to perform more modest tasks in the beginning. 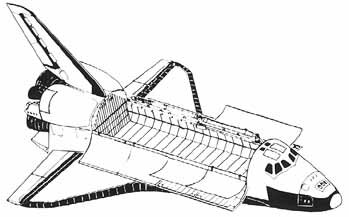 For reasons of economy, the Space Shuttle Task Force led by Charles J. Donlan (1970-1972) had rejected early ideas for a delta-wing craft perched on a much larger winged launch vehicle, which would itself be capable of flying back to the launch site. NASA limited its vision to smaller shuttle craft sent to orbit by a combination of its own main engines and expendable or partly expendable boosters. Fully reusable launch systems were put on hold (see figs. 2-9 through 2-11). Five aerospace companies had been conducting studies for NASA since 1969 to determine the most practical approach to shuttle design: Lockheed Missiles & Space Company, North American Rockwell Corporation, General Dynamics Corporation, Martin Marietta Corporation, and McDonnell Douglas Astronautics Company. ***** In May 1970, NASA awarded North American Rockwell and General Dynamics, working together as a spacecraft-launch vehicle team, and-month contract to define more fully their shuttle concept. McDonnell Douglas and Martin Marietta were chosen to submit a competitive design. ****** NASA's contractors spent the next 18 months refining their designs and adjusting their ideas to more realistic budgets and flight schedules. Shortly after receiving Nixon's imprimatur, the agency was ready with a request for proposals for the development and fabrication of a Shuttle orbiter. Four companies responded to the March 1972 request; Rockwell, McDonnell Douglas, Grumman Aerospace Corporation, and Lockheed delivered their proposals to the Manned Spacecraft Center in Houston on May 12. NASA had already awarded Rocketdyne, a division of General Dynamics, a letter contract for the orbiter's main engine and had announced the selection of contractors for many Shuttle subsystems before it named the prime contractor. On July 25, 1972, it was announced that North American Rockwell (later named Rockwell International) would be responsible for the design, development, and production of the orbiter. The value of the contract, which was awarded on August 9, was estimated at $2.6 billion over the next six years. NASA managers expected the first manned orbital flight of Shuttle to take place in 1978 and looked forward to a total of 445 flights during the first years of operations. + The first orbiter, to be used for horizontal flight testing, was due in mid-1976. Figure 2-9. The final design chosen for Shuttle included the orbiter, two reusable solid rocket boosters, and an external tank that would supply fuel to the orbiter's main engines. The 68 kilogram (dry weight) orbiter measured 23.79 meters at wingspan, was 3 7.2 meters in length, and 17.27 meters tall (vertical tail to landing gear.. At launch, the orbiter would be strapped to the large (47 meters tall) external tank. For more information on the solid rocket boosters, see chapter 1. The orbiter's three engines were designed to deliver a total thrust of 5 004 000 newtons. Figure 2-10. The orbiter's most practical feature for the prospective user was its cargo bay, designed to deliver payloads up to 29 484 kilograms to near-earth orbit. The bay measured 4.57 meters in diameter and 18 meters in length. On return trips, Shuttle could accommodate cargo weighing 14 515 kilograms. The most popular payloads planned for Shuttle were satellites and Spacelab, a manned scientific laboratory being built under the direction of the European Space Agency (formerly the European Space Research Organization). ....and landing tests. The main engines and the orbital maneuvering system and reaction control system propulsion units were simulated. Other subsystems not needed for atmospheric tests, such as the waste management system and the thermal protection system, were also not included on Orbiter 101.13 Enterprise would be strapped to the back of a modified Boeing 747 (called the Shuttle Carrier Aircraft) and flown about, first in a captive mode to verify performance of the two vehicles in mated flights, crew procedures, and systems operations. The first of five inert captive flight tests were performed on February 18, 1977; the first of three manned captive active tests took place on June 18. With the captive tests successfully completed, crewmen Fred W. Haise, Jr., Charles G. Fullerton, Joe H. Engle, and Richard H. Truly prepared for the free-flight tests. Figure 2-11. Shuttle's primary launch site would be the Kennedy Space Center in Florida. Two minutes after launch at an altitude of 44 kilometers, the spent solid rocket boosters would be separated from the orbiter. Eight minutes later at 109 kilometers, the external tank would be ejected. In orbit, the shuttle crew would perform their typical seven-day mission in a shirtsleeves environment, delivering satellites into the desired orbit, inspecting and repaying others, retrieving others for shipment back to earth. At reentry, the unpowered orbiter would glide to earth and land on a runway like an airplane at speeds of 343 to 363 kilometers per hour. The primary touchdown site would be the Edwards Air Force Base in the California desert. Figure 2-12. Enterprise separates from its carrier aircraft during approach and landing tests. ...tion tests (see table 2-56 for a list of Shuttle Orbiter 101 flight tests).++ At Palmdale, work continued on Orbiter 102. As late as the winter of 1978, NASA was still hopeful that the second orbiter would be ready for orbital flight in 1979 (see figures 2-13 and 2-14). Unfortunately, Columbia and her crew would not be placed in service until April 1981. Qualifying the vehicle for spaceflight proved to be a more time-consuming process than the experts at NASA and its contractors had predicted. In 1979, the first flight was rescheduled for late 1980. In 1980, the date was set back to the spring of 1981 (see table 2-57 for a chronology of Shuttle orbiter development and operations). Table 2-56. Shuttle Orbiter 101 Flight Tests, 1977. Figure 2-13. NASA managers in 1978 were planning for Shuttle's first orbital flight to take place in 1979. Figure 2-14. This schedule shows how managers were planning in 1978 for Shuttle's first orbital flight. [121-124] Table 2-57. Chronology of Shuttle Orbiter Development and Operations. * The number and type of experiments varied with each mission. ** The astronauts transferred from the MOL program were Maj. Karol J. Bobko, USAF; Lt. Comdr. Robert L. Crippen, USN; Maj. Charles G. Fullerton, USAF; Maj. Henry W. Hartsfield, USAF; Maj. Robert F. Overmyer, USMC; Maj. Donald H. Peterson, USAF; and Lt. Comdr. Richard H. Truly, USN. *** The 35 candidates chosen in 1978 were Maj. Guion S. Bluford, USAF; Lt. Comdr. Daniel C. Brandenstein, USN; Capt. James F. Buchli, USMC; Lt. Comdr. Michael L. Coats, USN; Maj. Richard O. Covey, USAF; Lt. Comdr. John O. Creighton, USN; Maj. John M. Fabian, USAF; Anna L. Fisher; Lt. Dale A. Gardner, USN; Lt. Robert L. Gibson, USN; Maj. Frederick D. Gregory, USAF; Stanley D. Griggs; Terry J. Hart; Comdr. Frederick H. Hauck, USN; Steven A. Hawley; Jeffrey A. Hoffman; Shannon W. Lucid; Lt. Comdr. Jon A. McBride, USN; Ronald E. McNair; Capt. Richard M. Mullane, USAF; Capt. Steven R. Nagel, USAF; George D. Nelson; Capt. Ellison S. Onizuka, USAF; Judith A. Resnik; Sally K. Ride; Maj. Francis R. Scobee, USAF; Margaret R. Seddon; Capt. Brewster H. Shaw, Jr., USAF; Capt. Loren J. Shriver, USAF; Maj. Robert L. Stewart, USA; Kathryn D. Sullivan; Norman E. Thagard; James D. A. van Hoften; Lt. Comdr. David M. Walker, USN; and Lt. Comdr. Donald E. Williams, USN. **** The members of the three Skylab prime crews announced in January 1972 were Charles Conrad, Jr., Joseph P. Kerwin, and Paul J. Weitz on Skylab 2; Alan L. Bean, Owen K. Garriott, and Jack R. Lousma on Skylab 3; and Gerald P. Carr, Edward G. Gibson, and William R. Pogue on Skylab 4. *****Martin Marietta's initial work was conducted in-house, not funded by NASA. ******Also chosen to conduct feasibility studies of alternate shuttle designs were Grumman Aerospace Corporation-Boeing Company, Lockheed, and Chrysler Corporation. + The flight schedule released on April 2, 1973, by NASA Headquarters predicted 6 flights in 1978, 15 in 1979, 24 in 1980, 32 in 1981, 40 in 1982, 60 annually from 1983 through 1987, and 28 in 1988. ++ Marshall was also assigned management authority for the orbiter main engines, the solid rocket boosters, and the external tank.